“I’m so awesomely proud to show off our SCAD student work here in New York City with our incredible partners of Hugo Boss,” Michael Fink, SCAD’s dean of fashion explained at a dinner this week celebrating the school’s latest Etoile Award recipient: Hugo Boss CEO, Mark Brashear. Held at the Mallick Williams & Co gallery, which is currently exhibiting a display of Jeremy Kost’s jigsaw Polaroids, the event served as a platform to show off some of the school’s senior theses, which will take to the runway on May 19th in Savannah. “I’ve gone down there twice now, I just love the whole Savannah thing--they just own the whole town. I couldn’t be more impressed with the programs and the quality of the work," Fern Mallis said. “I’m so awesomely proud to show off our SCAD student work here in New York City with our incredible partners of Hugo Boss,” Michael Fink, SCAD’s dean of fashion explained at a dinner this week celebrating the school’s latest Etoile Award recipient: Hugo Boss CEO, Mark Brashear. Held at the Mallick Williams & Co gallery, which is currently exhibiting a display of Jeremy Kost’s jigsaw Polaroids, the event served as a platform to show off some of the school’s senior theses, which will take to the runway on May 19th in Savannah. “I’ve gone down there twice now, I just love the whole Savannah thing--they just own the whole town. I couldn’t be more impressed with the programs and the quality of the work," Fern Mallis said. "It’s nice when you get out of New York because we become so centric here--you realize that people are teaching design other places in the country, and doing it really well.” And she couldn’t have been more right--each of the student creations could without a doubt rival the skill sets of a Parsons graduate. Lucky for us, we were seated amongst a flurry of Boss employees—each dressed in the company’s razor-sharp attire to celebrate their CEO. Between dinner and dessert Australian actor (and total hottie) Hugh Sheridan popped up from his seat to sing Brashear a song in the vain of Elvis Costello, eliciting warm smiles from even the straightest members of the Boss clan. But despite the serenade from a smoldering pacific rim import, Brashear remained humble, just as much in awe of SCAD as his fellow attendees. 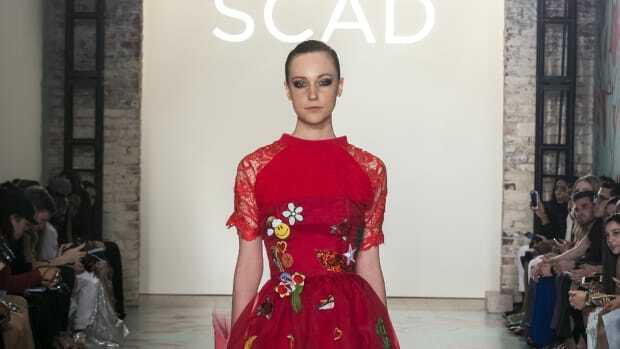 “I’m particularly honored to be presented with an award from a creative institution as renowned as SCAD. They value what I personally value in my life: individuals pursuing their dreams and taking a creative path, not just the safe path,” he proudly explained. Click through to see more images from the event.